Medical bills can pile up, even with health insurance. 2. Can I Have an Early Distribution From My IRA Without Penalty If I Am Disabled? Unexpected, unreimbursed medicals bills can pile up quickly, leaving anyone facing them without a clue as to how to pay them. Such a situation can arise from an unexpected illness, an emergency, or loss of employment, but the Internal Revenue Service does allow retirement planners the ability to tap into their traditional and Roth IRA accounts -- within reason -- to pay for medical bills. Under traditional IRA rules, you cannot pull money from your IRA without incurring a 10-percent penalty if you are less than 59 1/2 years old. Roth IRAs allow distributions of the money you put in at any time, but you cannot pull out your Roth’s earnings unless you meet the same age requirement as traditional IRAs, and have had your Roth IRA for at least five years. If you pull out your Roth earnings prior to meeting these stipulations, you will also be fined 10 percent by the IRS. There are a few exceptions to the 10-percent early withdrawal penalty, and medical bills can be one of them. Although medically related expenses are sometimes exempt from the early withdrawal penalty, the IRS still doesn’t make it easy to claim absolutely everything; you must jump through some hoops. If your illness results in permanent disability, you may tap into your traditional or Roth IRA for your medical bills. You may also tap into your traditional or Roth IRA if you are temporarily unemployed and need to use the funds to keep your medical insurance active. Finally, you may pull money out of either type of IRA if, per the IRS, “You have unreimbursed medical expenses that are more than 7.5 percent of your adjusted gross income.” These exemptions allow you to pull the money out of your IRA without likely incurring the 10-percent early withdrawal penalty, but you must still pay income taxes on the money you pull out of a traditional IRA. Assume for the moment that you have incurred unexpected, unreimbursed medical expenses totaling $50,000 from an emergency situation. Your adjusted gross income, which is your taxable income less any allowable deductions, is $250,000. To find the allowable amount of the expenses that you can pay using your IRA, first multiply your adjusted gross income, $250,000, by 7.5 percent -- or .075 on a calculator. The result is $18,750. Subtract $18,750 from $50,000, which equals $31,250. This is the total dollar amount of your unreimbursed medical bills that you should be able to withdraw from your IRA penalty-free. Contact your IRA plan administrator to request the calculated distribution amount to pay your medical bills. 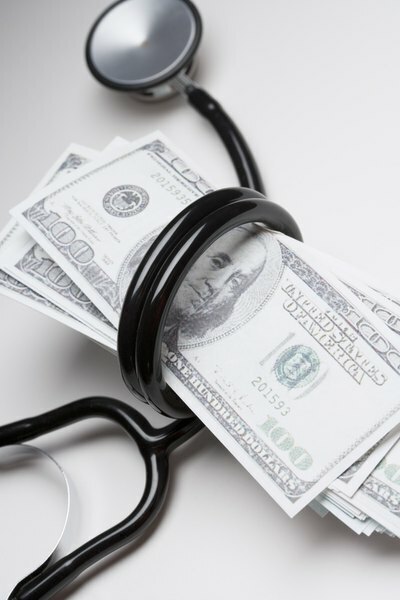 Even if you’ve met all of the IRS qualifications to use your IRA monies to cover your medical expenses, the IRS will look at your other assets before it decides whether to allow the IRA distribution penalty-free. If the IRS finds that you had other assets that you could have cashed in, such as stocks, bonds or savings, yet you chose to pull the money from your IRA, it reserves the right to assess the 10-percent penalty on the IRA withdrawal, even if you did use the money to pay for your unreimbursed medical bills. What Do I Need to Do to Withdraw Early From Rollover IRA? Can a Penalty Be Waived on an IRA if Unemployed? Can I Withdraw Money From an SEP-IRA?